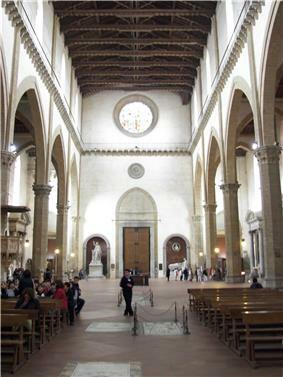 Basilica of Santa Croce in Florence. The Primo Chiostro, the main cloister, houses the Cappella dei Pazzi, built as the chapter house, completed in the 1470s. Filippo Brunelleschi (who had designed and executed the dome of the Duomo) was involved in its design which has remained rigorously simple and unadorned. In 1560, the neo-Gothic marble façade, by Nicolò Matas, dates from 1857-1863. 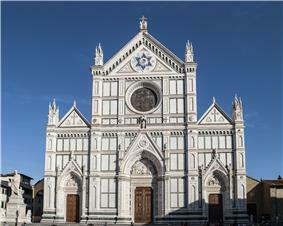 A Jewish architect Niccolo Matas from Ancona, designed the church's 19th-century neo-Gothic facade, working a prominent Star of David into the composition. Matas had wanted to be buried with his peers but because he was Jewish, he was buried under the porch and not within the walls. In 1866, the complex became public property, as a part of government suppression of most religious houses, following the wars that gained Italian independence and unity. Maso di Banco (frescoes in Cappella Bardi di Vernio) depicting Scenes from the life of St.Sylvester (1335–1338). 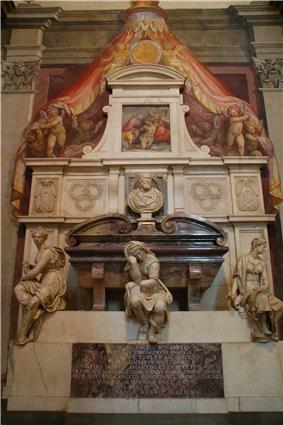 Once present in the church's Medici Chapel, but now split between the Florentine Galleries and the Bagatti Valsecchi Museum in Milan, is a polyptych by Lorenzo di Niccolò.